South Korea’s financial regulator unveiled Monday plans to create an electronic system to track real-time foreign stock transactions and changes in outstanding stocks, in order to ramp up oversight of securities trade here amid growing public distrust in the current system and hostility against short selling. Through a newly created monitoring system, the Korea Securities Depository would cross-check the volume of outstanding stocks reported by the custodian bank of each foreign investor, before the market opens for trade. During the trading session, the Korea Exchange would report records of investor stock transactions and reflect real-time changes in stock holdings by the investors. Short selling refers to the sale of borrowed shares in the hope that their price will go down. 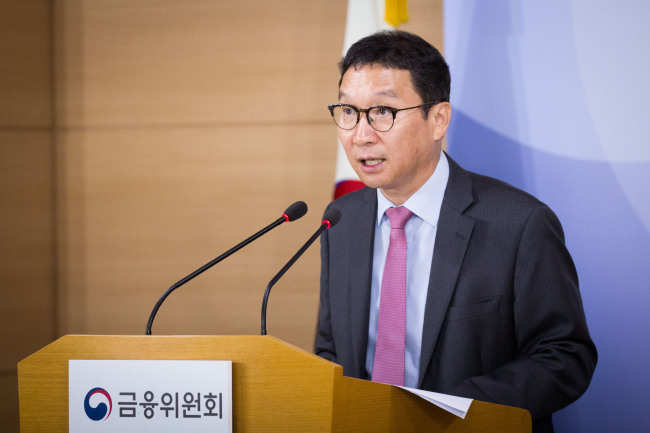 The overhaul is designed to take pre-emptive control of the process of stock transactions and foil deviations, said Kim Hak-soo, standing commissioner of the Securities and Futures Commission, in a press conference at the Government Complex Seoul on Monday. The SFC oversees capital markets in Korea under the authority of the Financial Services Commission. “If we can figure out whether a (foreign or institutional) investor orders stocks in excess of the upper limit during the process of stock transactions, we can prevent accidents due to mistakes or errors,” Kim said. Under the current system, the regulator had trouble tracking intraday stock transactions because the oversight of outstanding stocks took place after the market closed. Kim added the system would also be used to monitor illegal short selling by large investors. The new system is slated to take effect starting from the first half of 2019, while the plan is expected to fully materialize by the third quarter of this year, according to Kim. Also, the FSC will give brokerages legal mandates to verify if the volume of total outstanding stocks equals the sum of stock holdings by investors individually, before the market opens. Trade will be denied if an error is found in an account. These are part of a set of measures to prevent loopholes in stock trade, which have resulted in computational errors like the recent dividend payout fiasco involving Samsung Securities. In April, Samsung Securities, the fourth-largest brokerage in terms of net asset value in Korea, mistakenly issued unauthorized shares as dividends to employees. The mistake enabled the trade of stocks worth 33 times greater than the company’s market cap given to some 2,000 Samsung Securities employees. Twenty-two of the employees attempted to sell the unauthorized stocks, while those of 16 employees were actually sold. Other measures included a system in which trade by employees in a brokerage would be put to a halt immediately in case of irregularities. Along with the strengthened monitoring system, the FSC vowed to come up with a revision by the third quarter of this year that would allow short sellers to face criminal charges if they are found to have used insider information.